From our pocket sized wedge sharpeners to our ergonomically correct "Chubby", these sharpeners feature a steel cutting blade that can easily be replaced. Our canister sharpeners have either a single hole for normal pencils or offer a double hole for oversized artist pencils. Each shavings cup can easily be removed and emptied. Our round bottomed "Chubby" sharpener fits comfortably in the palm of you hand and is available with a blue, red or yellow top. These sharpeners are fun to use and are a great item for younger artists. 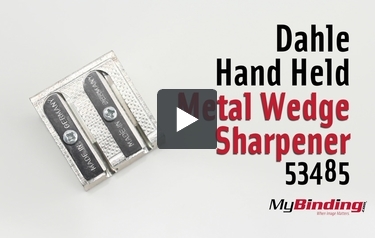 Transcript: This is the Dahle Hand Held Metal Wedge Sharpener #53485! The sharpener on the left is for standard sized pencils, where as on the right you can sharpen larger pencils. Unlike most similar sharpeners, it is completely made of metal, with some German blades. Insert your wood pencil and twist it against the blade. If you are not careful this could easily dirty your fingers. And it is possible to oversharpen your pencil, so keep a watchful eye. This is the Dahle Hand Held Metal Wedge Sharpener #53485! But this is a good example of the final result.